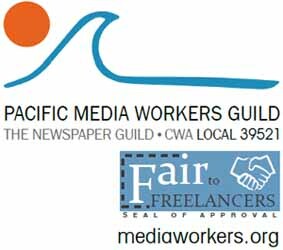 Management of the Bay Area News Group-East Bay, a local affiliate of MediaNews and Digital First Media, met with East Bay media workers Tuesday for preliminary talks over a new collective bargaining agreement between BANG and Pacific Media Workers Guild. Wolf spent 226 days at the federal detention center in Dublin between August 2006 and April 2007 – an experience he describes as “more boring than brutal” — for refusing to surrender raw video footage and give testimony to a federal grand jury about a Mission District demonstration in July 2005. Wolf spent 226 days, mostly in solitary confinement, at the federal detention center in Dublin between August 2006 and April 2007 for refusing to surrender raw video footage and give testimony to a federal grand jury regarding violent incidents at an anarchists’ rally in July 2005.